* Film studio executives are too young -- learning to write requires decades of practice. * Hollywood has sacrificed story- telling on the altar of special effects. * Scientists are failing to excite people because they teach instead of preach. 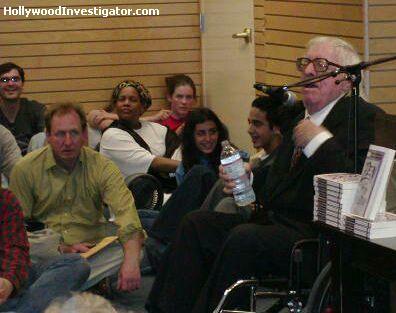 Those were some of the points made by author Ray Bradbury, 81, at the Santa Monica Barnes & Noble Bookstore, on April 18, 2002, in a talk sponsored by the Writers Colony workshop. "I came from nowhere," began Bradbury, today renowned for science fantasy and horror literary classics such as The Martian Chronicles, The Illustrated Man, The October Country, and Fahrenheit 451. "I couldn't write anything. But I had a dream of being a writer, in my heart. So I began to write when I was 12 -- and I'm still learning." Emphasizing that writing is a craft that requires years, even decades, of daily practice, he quipped, "You wouldn't hire a carpenter who hadn't studied his craft, would you? "I'm riding herd on five motion pictures right now, and all the people at all the studios are stupid. They're so goddamned dumb, I can't believe it. They've all gone to college, and they think they know how to write. They haven't even been to kindergarten. "Mel Gibson has owned the rights to do a new version of Fahrenheit 451 for 6 years. There have been 10 screenplays. Jesus Christ, shoot the book! It's a screenplay, look at the goddamned thing!" Bradbury regards his literary works as inherently visual, ready-made for dramatic presentation. "Because I collect metaphors, I can work in television. I can work in films. I can work on the stage -- because it's spoken metaphor. "When I did my Bradbury series on TV, I did 64 scripts. I typed them out of my book. Re-typed my short stories, and added the names to the characters, and I had a teleplay. "But these [studio] people come along, and they want to start in the middle of things. They want to do fireworks." Lamenting Hollywood's emphasis on pyrotechnics at the expense of stories and ideas, Bradbury once told a panel of special effects experts: "You do fireworks. And I love fireworks. I love to be in Paris on Bastille night by the Eiffel Tower, with all the fireworks going off, celebrating the failed French revolution. But when the wind blows, the sky is empty. All that lovely fire, all those lovely cathedral patterns, blow away in the wind. That's you. "That's what's wrong with so many American films. For Christsake's, get someone with a brain, to put in the center of the fireworks, so that when the wind blows the fireworks away, the idea's still there. I don't ask for a high and mighty subject. Just give me a little idea. A tiny one. "If I can write a short story about putting on the first tennis shoes of summer, and make you remember what it was like when you were a kid, when you could run away from all your enemies, and run to your friends calling you up ahead, when you could bounce over houses and trees, and even people and so on, if I could make you remember that, that's better than fireworks. "If I can put those tennis shoes in the middle of the fireworks, you may not have a big idea, but you'll have one to warm your heart on winter nights. I get letters from people saying, 'Thank you for the tennis shoes. Thank you for the dandelion wine.'" "I said, 'You're teaching and you should be preaching. A planetarium is a cathedral. A cathedral of space, where you go to worship the universe. You're trying to teach science in there. No, no, get out of the way and let me celebrate the universe. Let me shout and scream for you. And if I do a good job, people on the way out will buy your damn books. They'll go to the library, they'll borrow the books. But you can't put the books on the ceiling. Put the exhilaration up there.
" 'A good teacher is an exhilarator. All the good teachers we've had, we fell in love with because they were in love with life. Now let me be in love with life. I'll stand in the middle of the planetarium, and I'll shout at the birth of the universe.' "
Replying to the Smithsonian, Bradbury said, "You want to go on boring the people, don't you? You want to teach, instead of preach. What's the one thing I do that's the worst?" After that, his relationship with the Smithsonian deteriorated. Finally, the project still unfinished, Bradbury offered to take only $7,000 instead of the $17,000 owed him, if only the Smithsonian released him from the contract. Bradbury then took his show to the Aerospace Museum at Exposition Park, where it's still playing as "Windows on the Universe." But after writing his show, Bradbury says, "I got to brooding over the Big Bang Theory. This guy is completely wrong. Why wouldn't it be possible that the universe has been here forever? Isn't that a better idea? Is it impossible? Everything's impossible! We are impossible! "We don't know how life came on the Earth. Not the vaguest idea. All the shows that they put on, with all the scientists trying to explain the bombardment of the Earth by lightning, the growth of simple cells from the seas, and the fishes crawling out on the land, and learning to do all these things. They have no knowledge. "So I thought to myself, what the hell. The universe has been here forever, so let's stop worrying about it. Let's get on with our lives. "The next thought was, why are we here? What is the purpose of life? A lot of people say it's meaningless. Nonsense. There's no use having a cosmos, no use having a universe, if you don't have an audience. The universe, needing an audience, created us. We are the meaning of life. "We're the gift the universe gives back to itself. It's us, we're it, we're responsible," stressed Bradbury, echoing the philosophy from his Martian Chronicles. "You are the audience. You are responsible. You must give back. "You're gonna be here just once. You're not coming again. You owe, because you have been born, and have lived here. By the end of your life, you got to improve the world, improve everything that you touch. Not a big thing, a small thing. As simple and as complex as children, as simple as friends, as simple as love. "I put that in my next planetarium show. "And we make such fun of ourselves. We watch local TV news, which denigrates us. Turn off the goddamn set. "We're here to witness the miraculous. 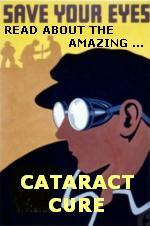 The gift of sight is incredible. There was no sight in the world at one time. The eye had to be invented. How in the hell do you invent an eye, I don't know. Darwin doesn't explain it. There are big leaps and jumps and empty places in Darwin. I have no explanation." Bradbury discusses his philosophy in an upcoming collection of essays, "Too Soon From The Caves, Too Far From The Stars," due later this year. "We're the in-between generation," said Bradbury. "We've only been out of the cave a few years, and we have to forgive ourselves. Because we're a mess in many ways. There are eight or nine wars going on right now. We're only paying attention to two of them, in Afghanistan and in the middle east. And there are others which we're ignoring. "But we have to forgive ourselves, because eventually we'll go back to the moon, we'll go to Mars, and we'll leave all this behind. We'll have an effort to start fresh. It's like the immigration to America four hundred, five hundred years ago. I have hope for the future. "You're only a failure if you give up," added Bradbury, giving hope to aspiring writers. "At age eight, I ran up on stage and helped Blackstone disappear an elephant. I got a rabbit as a prize. I became an amateur magician. One of my dreams was to grow up and become a magician. Well, that's what happened. "I'm not a science fiction writer. I'm a magician. I can use words to make you believe anything. But it's taken a long time." 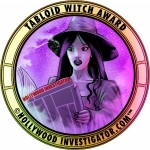 Speaking to the Hollywood Investigator, Barnes & Noble Community Relations Manager John Schatzel estimated that 175 patrons attended Bradbury's talk. Many stayed afterwards for book-signings. The Writer's Colony, which sponsored Bradbury's talk, meets the first and third Thursday evenings every month at Barnes & Noble, 1201 Third Street Promenade, Santa Monica, CA 90401. 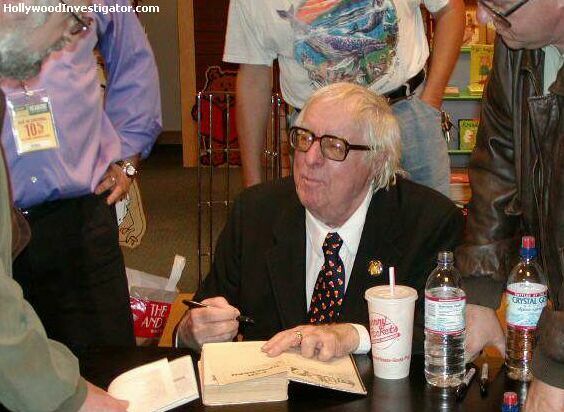 Ray Bradbury will appear at the L.A. Festival of Books on the weekend of April 27-28, 2002, at the UCLA campus. Also visit: RayBradbury.com.